July 2018 issue on sale now! | What Hi-Fi? July 2018 issue on sale now! Vinyl is the music format that refuses to go quietly. The latest issue of What Hi-Fi? pays tribute to our enduring love of playing records. In these changing times, there are some things we can rely upon – England’s early World Cup exit, a rainy Bank Holiday and a continuing love affair with vinyl. Vinyl is the format that simply refuses to die. Sales are booming and record players are now just as common a sight in student bedrooms as they are in hi-fi enthusiast’s listening rooms. 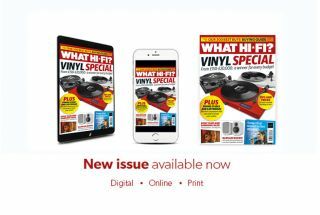 The July issue of What Hi-Fi?, available on newsstands today, pays tribute to our enduring love of all things vinyl, with a special issue dedicated to the wonderful and varied kit required to play records. From the best turntables on the market, to other essentials such as phono stages and cartridges, our expert recommendations will ensure you get the best out of your deck. Once condemned to the scrapheap (and many a car boot sale or charity shop), vinyl has enjoyed a remarkable turnaround in fortunes. From reading the sleeve notes to placing the disc on the turntable platter, nothing beats the feeling of owning a record. And whether you’re new to the joys of vinyl or rediscovering the format after a dalliance with digital, we have everything you need to get started. Our Vinyl Special issue features 15 of the best decks money can buy. With decks ranging from £150 to £20k, we’ve got all tastes and budgets covered. We also test four excellent phono amps, to discover which is the class leader. And if you’re looking to upgrade, we review four of the best cartridges too. So you’ve chosen your turntable, but our handy advice doesn’t stop there. Our Vinyl Special issue contains loads of tips on how to set up and care for your turntable and how to get the best sound from it. Ever wondered how vinyl works? Read our feature to find out how a turntable turns those record grooves into groovy records. Is it witchcraft or some other form of magic? Find out in the July issue of What Hi-Fi? Still unconvinced by the sonic merits of vinyl? Read our feature on tracks that sound better played in this format and you’re sure to conclude that this remains one of the best ways to listen to music. There’s something of the Noah’s Ark about July issue’s First Tests section, as the latest hi-fi kit lines up two by two. This month, we feature two turntables in the Rega Planar 1 Plus and the Lenco L-91, two pairs of stereo speakers (the Fyne Audio F302s and Q Acoustics 3010is) and two televisions (Sony’s KD-65AF8 and Samsung’s QE55Q9FN). Our reviewers describe this latest Samsung QLED as “a stunning achievement”. There’s also a review of the Pure Move T4, a good old-fashioned radio and, at the opposite end of the technology scale, LG’s WK7 ThinQ smart speaker. And finally, we review the latest version of the iPad, the Apple iPad 2018, and come to the conclusion it’s the “best tablet available for this money”. In Temptations this month, we review the KEF Reference 1 stereo speakers and the dCS Rossini DAC/Master Clock – that’s over £27k worth of kit to start saving up for. Our That Was Then feature looks back at the Musical Fidelity X-LP phono stage. As the predecessor of one of the products featured in our phono stage group test, does this 1997 version still have what it takes? Plus: Don’t miss our special offer – a free Leatherman Style CS Multi-Tool (worth £30) – when you subscribe to What Hi-Fi? The July issue is not to be missed. So grab a copy of What Hi-Fi? from your local newsagents today. Or simply download it onto your tablet or smartphone. Enjoy!